From the very start the main threat to the existence of this predominantly Kurdish quasi-state came for obvious reasons from Turkey, where Turkish Kurds were set on securing autonomy. In addition, the most influential political force in Rojava, the Democratic Union Party, is affiliated with the Kurdistan Workers' Party, and the latter has officially been declared a terrorist organization and unofficially – a number one enemy - in Turkey. In January-March 2018, the Turkish army, backed by the Arab and Turkomanen allies, occupied part of the territory of Rojava (canton Afrin). And it looks like Ankara plans to settle on these territories: recently, Turkish President Recep Tayyip Erdogan reiterated that Afrin will be transferred to its residents “when the time comes” and that “this time will be set by us”. [i] In the meantime, according to local media reports, the demographic situation in the canton is changing rapidly. Taking advantage of the fact that many Kurds left their homes at the approach of the Turkish army, the local (in fact, Turkish) administration is bringing in Arabs here, who, in many cases, are not Syrian Arabs. In Syria, the Americans decided to replay the “Kosovo scenario”, by turning part of a sovereign state into a political structure, which is allied to them. Washington, which only recently excluded the People’s Protection Units (the armed wing of the Democratic Forces), from the list of terrorist organizations, argues, like Ankara, that its military personnel will remain in the region “for an indefinite period” to protect Kurdish territories from “aggression” on the part of Damascus. And from Ankara's ambitions as well. But this is read between the lines. All this enabled Turkey to accuse the United States of supporting terrorism and relations between the two countries quickly deteriorated into a crisis. As mutual accusations, occasionally supported by political and economic demarches, persist, the parties, however, are beginning to look for common ground. 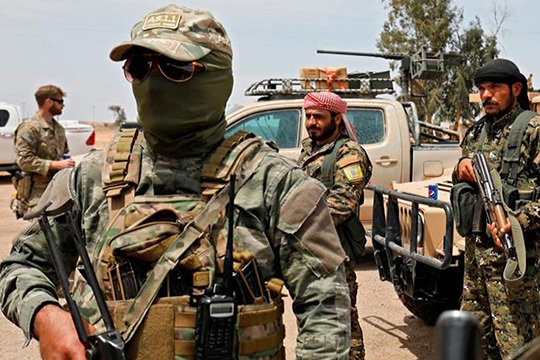 Talks on June 4, 2018 in Washington between Turkish Foreign Minister Mevlut Cavusoglu and US Secretary of State Michael Pompeo resulted in a “road map” for the withdrawal of Kurdish forces from predominantly Arab Manbij, which Kurds regained control of from ISIL (an organization banned in Russia) two years ago. The next day, the Turkish minister announced that the Kurdish troops "... would retreat east of the Euphrates. However, this does not mean that we will agree that they stay there. ”[Ii] On September 24, 2018, upon arriving at the UN General Assembly, Erdogan confirmed: Turkey will expand its sphere of influence in Syria, by including areas that are under control of the Kurdish armed units. Firstly, it could be a hypothetical "Arab NATO" with Saudi Arabia in the lead. But there are serious doubts as to the effectiveness of such a structure - even if we forget about the level of combat readiness of these kinds of coalitions (in Yemen, for example), Arab countries could unite only on an anti-Israeli platform. And that, as history shows, is unlikely to yield success. In addition to this, it is still unclear how Kurds, the majority of whom are not religious, will react to Wahhabi commanders. 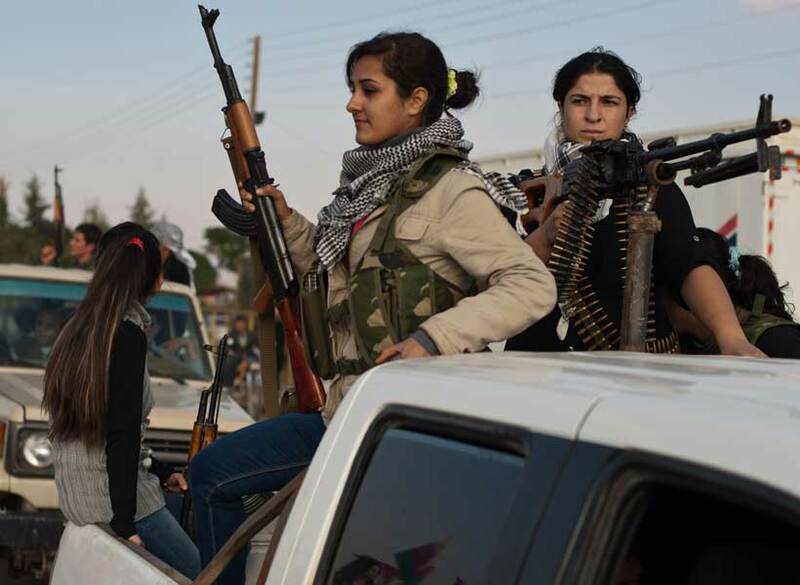 Secondly, the United States could choose to strengthen the Arab sector of the "Syrian Democratic Forces" (Rojava militia) at the expense of the Kurds. In mid-September, a number of media outlets, citing sources in the Syrian opposition, reported that Saudi emissaries had already suggested this option while meeting with leaders of the Arab tribes living east of the Euphrates. However, this development is also fraught with the Kurdish-Arab confrontation. Thirdly, Washington persists in its attempts to improve relations with Turkey, distancing it from Russia and Iran, and instruct it to “maintain order” in the region: the Americans did not intervene in the Operation Olive Branch and made concessions on Manbij. Even though this might seem strange amid the hostile American-Turkish rhetoric, military and political contacts between Washington and Ankara have been on the rise in recent months. Moreover, President Erdogan has already stated that he believes in an early improvement of relations with the United States despite the "inconsistency" and "economic aggression" of Washington. Meanwhile, we need to remember that the US control over Kurds is far from unlimited. The “people's protection units” are ideologically close to the Kurdistan Workers' Party (or could even be seen as its “branch” in Syria), and the PKK itself, grown on the Marxist ideas, would normally support the Soviet Union and “by inertia” - Russia. For this reason, the Americans have to threaten the Kurdish allies with a cessation of military and financial support. Reports say the US and Turkish troops are already operating in the Manbij area, having dislodged the Kurdish YPG militia from the area. These threats, along with the self-withdrawal of the United States during the capture of Afrin by Turkish troops, have made Kurds doubt the reliability of their patron. The result is a move towards rapprochement with Damascus. In late July, the Kurdish leadership announced an agreement with the Syrian authorities on the creation of a "road map" for the formation of a decentralized Syria. Question: What are you planning to do for (Syrian - AI) Kurds?